The following comments about attractions in Myrtle Beach have been posted from individuals. We believe that the best reviews of Myrtle Beach, South Carolina (SC), SC USA are written by travelers and holiday makers who have experienced Myrtle Beach first hand and want to share their thoughts. Can you share yours? Please help us expand this section of our Myrtle Beach World Guide. 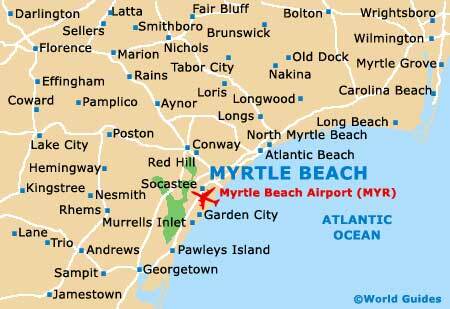 Let us know what you think about the attractions in Myrtle Beach, South Carolina (SC) USA. Submit comments about Myrtle Beach attractions here. We spent hours hanging out on the beachfront and along the Great Strand. This is a really good family beach and my children enjoyed marching around with their buckets and collecting sea shells, and having a paddle. The water wasn't particularly warm though. It can get busy by the time that the afternoon arrives. Pavilion Amusement Park at Myrtle Beach - It was a lot of fun before it closed! Everyone used to enjoy the roller coasters at the Myrtle Beach Pavilion Amusement Park and it is such a tragedy that it has now closed. The 30 September 2006 was the last day before the official closure and draw quite a crowd. Some of the rides, such as the carousel, will be relocated nearby, apparently. Please note that these Myrtle Beach, South Carolina (SC), SC USA comments and reviews are posted by individuals and are not necessarily the views of World Guides.